Details here. Could copycat cases be edging toward the east coast? This is the sort of thing that AFT keynote speaker Bill Gates would spread like cancer if he had half a chance. They are likely to appeal the lower court decision, and a final resolution could take years. It's quite clear to me the zillionaires who brought this case don't give a damn about California kids, our kids, or any kids of the bootless and unhorsed. This is a head on attack against union from the usual suspects. If LIFO is unfair for teachers, how can it be fair for anyone else in a union? Apparently, it's better to rely on the opinions of junk science purveyors like Gates, Cuomo, and Duncan. 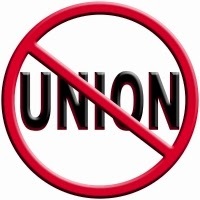 I have a lot of issues with our union but I'm absolutely certain we're better off with it than without it. It's time for unions to take a strong stand, not that this is anything new. Without seniority or tenure protections we might as well all go work for Eva Moskowitz. I was pretty upset when UFT partnered with Steve Barr and Green Dot to bring his union-lite, no tenure, no seniority crap to NYC. If things like this are permitted to spread teaching will be a step up from Walmart associate, if that. It is not ultimately helpful to our students to turn an available and worthwhile career into crap. But there's big money in the US set on doing just that. It's time to stop appeasing these people. It's time to stop throwing them mayoral control here, VAM there, and Common Core somewhere else. It's time to stop saying, "OK, ATR teachers can have a second-tier due process." It's time to stop claiming such things aren't tremendous givebacks for which we gain absolutely nothing in the long run. It's absolutely clear what corporate reformers want, and no seat at any table is worth playing their game. It ends with knives in all our backs.